Winter steelheading can be very challenging. Frigid winds, ice, slush and bone chilling waters will test even the hardiest steelheader. But it's the individual who is willing to subject themselves to those bitter elements are the ones that will find success. 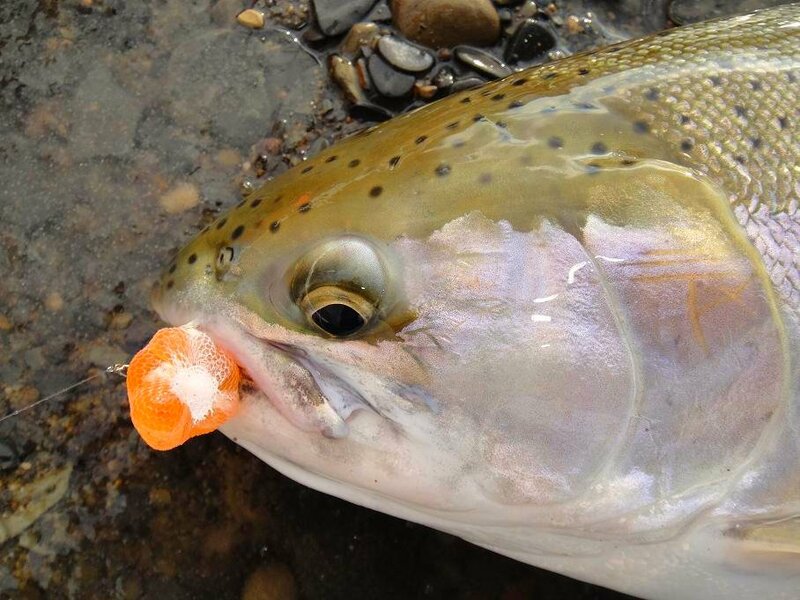 When the cold weather hits, the number of people on the rivers drop and the winter steelheader can find unfished waters with relative ease, even on the Rocky or the Chagrin. The weather isn't for the faint of heart and the majority of anglers often wait for warmer weather. I relish the winter months and I remember past trips of driving out east in squalls that swallowed the truck in front of me. Walking in fresh snow through the woods. Ignoring the throbbing pain in my feet as I've been standing in the water for too long. I've seen people walking along the Rocky River stare at me with disbelief as I'm standing in a freezing cold river. They often ask what are you fishing for? Or aren't you worried of hypothermia? I tell them and some admire my passion and dedication. Others think I'm crazy. The biggest foe for the winter steelheader is slush and ice. Slush also known as anchor ice will generally form in rivers during periods of extreme cold. Due to the motion of the water, ice cover may not form consistently, and the water will quickly reach its freezing point due to mixing and contact with the air. Ice platelets generally form very quickly in the water column and on submerged objects once conditions are optimal. Once this happens fishing can be difficult if not impossible. If there is enough space between blobs of slush then a successful drift can be done albeit short. If the river is choked in it, you'll be lucky to drop a bowling ball through it. Over the years, I've learned if the temperatures overnight are in the teens or low twenties, I'll sleep in and wait until it warms up. Generally slush will burn off by afternoon. Many times, I've drove through the metro park in the morning and watched guys trying in vain to fish in it, only to give up after a few hours. Side ice can also pose a problem as the best wintering holes can be covered over. Usually the fish will hide under the ice making it difficult to coax them out or drift right along the shelf. If the ice isn't thick, simply busting it up into sections and pushing it out will open up some water. For the angler looking to fish on side ice, they are playing a deadly game of chance. River ice is usually 15 percent weaker than pond or lake ice because underlying currents below can make it thinner then it appears. In the past, I did it a couple of times because I was desperate to catch fish, but I never felt comfortable doing it. Since then, I've stop doing because losing my life wasn't worth it. There is no such thing as 100% safe ice. Clothing can make your day enjoyable or down right miserable. I like to dress light because I often walk a lot. Even though it can be cold, I can break out in a sweat. For me nothing beats fleece because of wicking ability and retaining heat. For a typical winter outing, I wear a Under Armour base 2.0 crew shirt and leggings, Polartec 200 fleece pants and jacket, and polypropylene and wool socks. All of these provide warmth while keeping me dry. The only I will not wear are gloves when I'm fishing. I find gloves cumbersome and they are usually relegated in the back of my jacket and I only use them when walking from spot to spot. The most important piece to will make day enjoyable or a living hell are waders. There's I now that swear by neoprene waders, because it keeps much warmer then goretex waders. Personally, I find neoprenes too cumbersome and heavy. My goretex waders do a good enough job keeping me dry. The size of your boots is also important. Boots too small constrict blood flow into your feet. What happens is your feet will become colder faster. When buying boots, you should go a couple sizes bigger to accommodate the layer of socks that you'll be using. But, all of that doesn't matter if your feet start getting wet due to leaks. Once your feet are wet, your screwed. After an hour the pain starts getting worse and after a while its intolerable. I've experienced a couple of times and it's not fun when the day has to be cut short because your feet are killing you. Just like humans, fish react to the cold the same way, they don't like to move if they can help it. Since fish are cold blooded they prefer to seek out areas that don't have to expend a lot of energy. Prime spots include tailouts, large deep pools, and any structure such as bridge supports, dams, downed trees, and large rocks that deflect the current. But, I have seen steelhead leap out of the water when the water temperature was 34F and the air temperature was in the 20s. I had some fish fight like water logged boot and others rip off line. 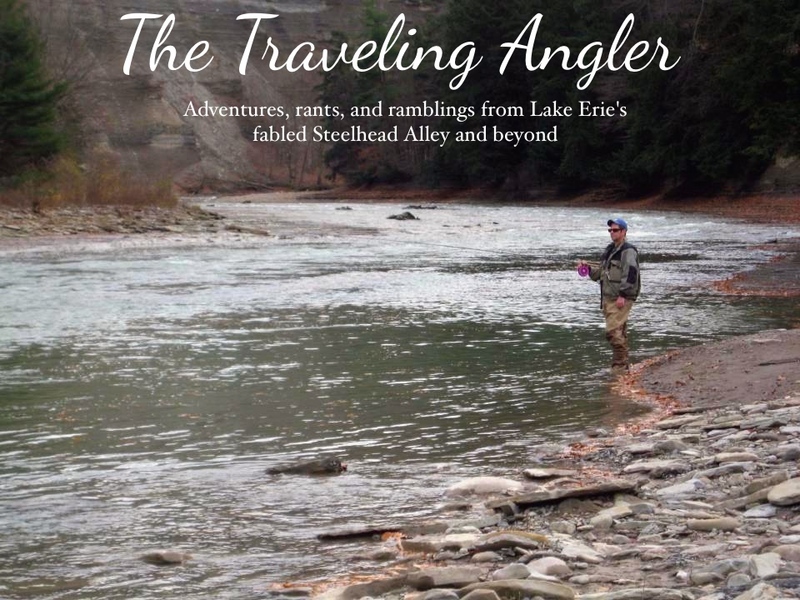 Winter steelheading can be either fantastic or a struggle. I've had times when I've hit fish in every spot and others times I couldn't buy a bite. You just never know what type of outing you'll have. 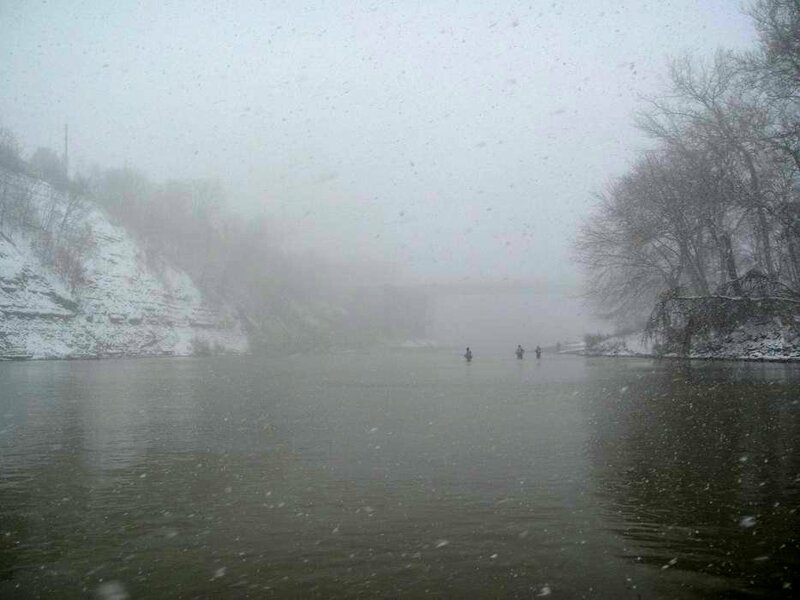 Winter steelheading can be fun if you dress warmly. The number of people out will often be low especially in the afternoon. It takes a lot of persistent as fish can be extremely difficult when it comes to taking your presentation. But the rewards can be great.